Cement chemists use a form of notation which, at first sight - and maybe second or third sight - may seem a little odd. 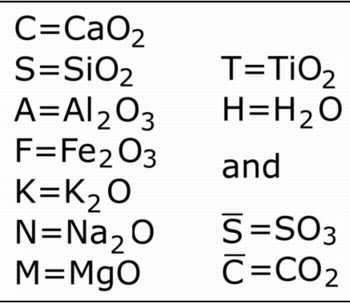 Oxides are referred to by their first letter: 'C' represents CaO; 'M' is MgO and so on, for all the oxides likely to be encountered in cementitious systems, as shown below. Alite: Ca3SiO5 in terms of its oxides is 3CaO.SiO2. The CaO term is shortened to C and the SiO2 to S. The compound thus becomes C3S. Belite: Similarly, Ca2SiO4 is 2CaO.SiO2, which is shortened to C2S. Tricalcium aluminate: Ca3Al2O6 is 3CaO.Al2O3. The Al2O3 term is shortened to A and the compound becomes C3A. Tetracalcium aluminoferrite: 2(Ca2AlFeO5) is 4CaO.Al2O3.Fe2O3. Fe2O3 is shortened to F and the compound becomes C4AF. Although strictly, these do not mean the same thing, they are frequently used indiscriminately. This lax use means that names like ‘C3A’ should not usually be taken to signify a definite composition in the sense of a pure compound, unless this is indicated by the context. To take another example, strictly speaking tricalcium silicate is a pure compound, while alite is a mineral composed largely of tricalcium silicate but also with a significant quantity of impurities, mainly magnesium, iron and aluminium. The symbols for carbonate and sulfate are referred to as 'C bar' and 'S bar,' for obvious reasons. These last two are used less than they once were, perhaps because they are tricky to write using a word processor. This notation is widely used in cement scientific literature and also in analyses and other information provided by cement manufacturers.